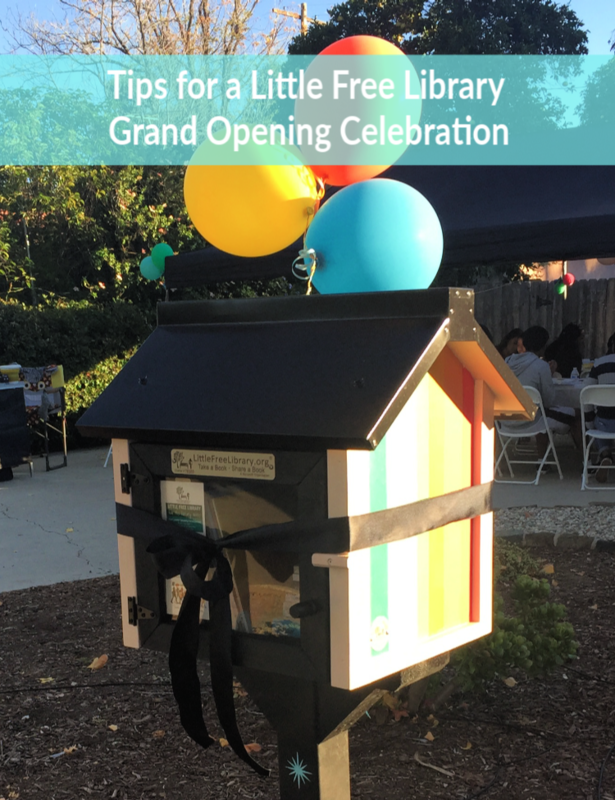 Earlier this month we celebrated the official grand opening of our Little Free Library. It was a special celebration filled with family, dear friends and lovely neighbors. The girls and I knew that we wanted to embark on this new adventure surrounded by some of the people who support and believe in our dreams no matter how mundane or magnificent. In our eyes, this Little Free Library, is so much bigger than us and already we see its little light shining brighter and brighter with each passing day. My littlest did a happy dance in the front yard after first discovering that someone had left a book and signed our guest book. I too did a happy dance but waited until I went back inside so I didn't scare any potential readers away. For our grand opening we decided to keep it relatively simple. After saving up to purchase the library and buying some books to put inside it, we decided that we would serve cookies and pastries with coffee, water and chocolate milk boxes to drink. The soiree started at 2 pm in hopes that guests could come after lunch. The money we would have used to buy a more substantial food lunch could be better allocated for activities meant to engage those who took the time to visit. We rented a table, some chairs and used 3 of our tables (2 folding and one that is usually in the backyard). We decorated with balloons, a couple banners and honeycombs. The wind presented a challenge but in the end it worked out. Activities consisted of making books and decorating bookmarks and at the request of our aunt I read a story. I picked the Day You Begin. I always say if I wasn't a social worker I'd be a teacher. I love reading aloud to little ones and was always excited when a teacher invited me to read to the class. But truth be told, the book I read is one that speaks to adults as well. We also had face painting which is where the majority of our celebration budget went. And if your curious if I would do it again — definitely. Karen from Fun Lab Art was so kind and talented! Have you ever seen a bookworm unicorn (You can see it in the highlights on our Instagram page)?! Even the adults joined in on the face painting fun! Our fellow bright lights left home with a book button or two. Hip! Hip! made my book button dreams come true and I continue to be so grateful! We also gave out bookmarks that were sent over by our friends at Brightly and post cards from our friends at CharlesBridge. We even shared an advent calendar made by happy teachers.happy learners. I'm pretty sure it's my favorite advent calendar ever because it shines a light on one of the greatest most important things we can be — KIND. I am hoping it will be available to download as a PDF again next year, be sure to follow them so you don’t miss it! While donations were not expected they were appreciated. We had a basket with a “book donations” sign purchased from the Little Free Library website. We were blessed with some really great books to share. While I’m clearly a fan of the book sharing concept I especially love the idea of passing on books that were once loved and cherished. We even had a neighbor who wasn't able to stay stop by with a box of books in tow; some of them were her daughter’s old books, a sweet story behind the story. She shared how wonderful she thought what my girls were doing was and it made them light up. They’ve been excited to do this but hearing and seeing the (potential) impact was affirming and inspiring. My little one’s kindergarten teacher came which in itself was AMAZING! The fact that she took the time out of her day to come support us meant so much. If it doesn’t happen at home, teachers are often the ones that introduce children to the magic of books and reading. I've said it before but the impact she had on my daughter lasted long after the last day of school. She's still making a difference in her life today. She's one of those teachers that you carry in your heart for all your days. I had a teacher like that and I'll never forget her. We had a few other special guests including an amazing coworker and friend whose daughter brought a book which she signed! And my boss! She spent time talking to the girls and participating in activities and I am grateful for how she’s supported our little dream. Thank you to everyone who came to celebrate with us, and a huge thank you to my friends who are more like family. Whatever our idea, dream or celebration you’re there for it. You bring love and light and your precious babies and I am are forever thankful for the gift of your friendship. 1. Pick a small window of time — 2 hours was just enough time especially given we were outside and it was starting to get a little chilly. People arrived and left whenever they were ready and having snacks and the same activities available throughout the entire time ensured no one missed out on anything. 2. Eat dessert first — Actually, just eat dessert! Serving a meal wasn't necessary in this case. Really, this was an opportunity to come together over a shared love of books. This was our chance to introduce our Little Library to the neighborhood, our family and friends and invite them to be a part of the adventure. 3. Skip the swag — Initially I worried about having favors, something tangible that they could take home but then I remembered my reason. All of this was because we wanted to shine a light in our neighborhood. We wanted to share our love of books and reading and help make it more accessible to our community. We had the chance to come together and fellowship with others, something we have been striving to do with greater intention. So, while guests didn't leave home with a swag bag filled with goodies I hope that they did leave with full hearts, a satisfied sweet tooth and the fabulous items that we did have to share. That said bookmarks, stickers, buttons and bookworms (the gummy kind of course) are all affordable options that are likely to be enjoyed. Additionally, your local library, or a neighborhood business or company that offers these items may be willing to donate. You never know until you ask right? Lastly, we had some literature titled “How Does This Library Work” available courtesy of the Just for Stewards section of the Little Free Library website. They have tons of informative and fun printables. We put some of these items in the library too, so that we could still share them with those who couldn’t make the celebration. 4. Identify someone who can help take photos — We were on such a time crunch thanks to our duking it out with the wind most of the morning that I didn't get a chance to take photos. Thankfully my mom and some of my friends did and sent them to me. If not for them we would have very few photos of the festivities. 5. Select your date carefully — We really wanted to be up and running before the end of the year. After all, our logo said EST 2018 :). After a few unforeseen delays our opening ended up being scheduled for December. This meant the possibility of showers (I referenced the almanac in hopes to avoid rain) and people not being able to come due to other holiday commitments. December is such a busy month. As a result we had some last minute cancellations and people who said they were coming but ultimately didn’t make it. If you’re looking to have a big turn out you may want to consider what else is taking place around the date and time you intend to have your grand opening. That said, there’s something to be said about having a grand opening during the most wonderful time of the year aka the happiest season of all. And if you absolutely need a count consider asking for people to RSVP. I didn’t and as a result bought way too much food, bookmarks and books but it's hard to tell with this sort of thing, particularly when you don't request RSVPS besides they are all items we can still use (and eat!). 6. Get the word out — With the rain we got that week we didn't post flyers as early as planned. Since it was at our house a small part of me worried about the possibility of more people than pastries given how close we are to the neighborhood elementary school and, germs had just made their way around our house so cancelling was a concern. Looking back it would have been nice to either distribute flyers in our neighborhood earlier or even put up some sort of sign (like real estate agents do when there's an open house) but I also believe the turn out we had was perfect. A more intimate gathering meant remember every face, every friend and got to connect with each of them. 7. Don’t forget the books — We curated a nice stack of books in case we did get a wave of people; we didn’t want to run out days after opening. We’ve been so blessed by the generosity of family, friends and also neighbors who are beginning to share their own books. 8. Have fun — In all of the planning and setting up and finally, welcoming don’t forget to have fun. Cling to your reason, why you’re doing this. I’ve come to the conclusion that being able to be a Little Free Library Steward is a gift. I get to share books in my community alongside my daughters. Each day they run and check on the little library they saved up for, that their dad so lovingly installed and that has been filled with books that came from people who love them. And now, we get to shine a light in our neighborhood by sharing books. If you have questions feel free to leave a comment and for those of you who can offer tips please do share them! Finally, if you haven’t yet, please join us on Instagram to find out what books we are reading and sharing and to see more photos from our grand opening celebration.